I love the Olympics. I grew up in America, my family is all from Australia, I was born in Canada, and now I've lived and taught in Korea for almost two years. I am literally always excited when the Olympics is happening. 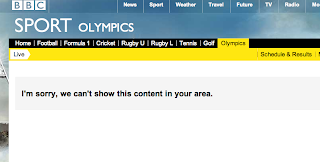 However, I have never been in a non-English speaking country for the Olympics and it is driving me absolutely nuts. So this post is dedicated to those expats out there stuck with a foreign language TV package and can't understand anything. Or those super mad about NBC's ridiculous coverage of Phelps and Lochte...I mean the games. Who is covering the games like a boss? BBC. That's who. Just head on over to bbc.co.uk and ohhhh..
That's right. No dice. It's just endless Judo and Badminton (badminton is awesome btw) on Korean TV. But no! This is the internet we are talking about! There's a way to get any entertainment you want as long as you have the will. So here we go. Sites like Watch Series allow you to stream the games fairly easily, but these get shut down all the time and just basically aren't reliable. The best site that I know can be found Here. Wiziwig does a good job having the entire schedule, as well as updated streams pulled from all over the internet into one, easy to use site. This is, for free, the easiest and most reliable way to get live BBC coverage. This is where it's at. One good way if you are using Firefox or Chrome is to get Foxy Proxy. Although it does take a little work..
Once you have that turned on for all URLs then head over to BBC Live and hopefully it works! The proxies can sometimes be slow however..and it doesn't always work. If you want reliable coverage, you want it to be BBC, and you don't mind paying a little bit. Then there are some really good VPN subscription services like tunnelr also available to you. A VPN, or Virtual Private Network, allows computers on remote networks to access each other's resources without restriction. A VPN like tunnelr will allow you, for $5 during the olympics, access the BBC no problem as fast as your internet connection will go and is definitely the most reliable. Solution 4- Sneaky Free VPN! Not sure how well this works but I'm aware of a VPN service called Security Kiss that allows (with a 300mb cap) for a free UK VPN. I don't know much about it, but it sounds great! Worth a shot. So there you have it. A few options for those abroad, or those sick of their own countries bad coverage. I hope this helps and if you have another solution that is working for you, please share! David Letts was born in Montreal to an Australian family and grew up in Boston. He graduated from the University of Wisconsin-Madison and then immediately made his way out to Korea and is currently teaching for his second year in Anyang. With a better focus on saving money as well as exploration David is going to try to see as much as he can before this year is up. Follow his blog to see what he’s up to!